It’s time for an amazing night of comedy. This month, We have another BANGIN lineup to get you tuned up for Saturday night! 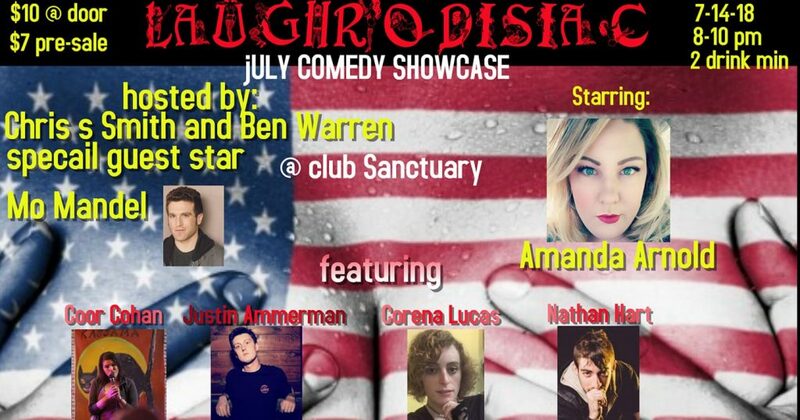 Come down to your favorite club Sanctuary, enjoy some tasty beverages, and check out these amazing comedians!! Tickets are $7 in advance, $10 at the door. Not only is the show great but your ticket gets you into the after party which is always a blast. As soon as Amanda Arnold gets on stage, you’re ready to laugh. Her brilliant, fast-paced, honest and commonsensical style earned her a bi-monthly show at Helium Comedy Club in her hometown of Portland, Oregon where she is a regular having the privilege to work with brilliant comics such as Bert Kreischer, Dave Attell, Nikki Glaser, Jay Pharoah and Nate Bargatze just to name a few. Amanda was named one of the “Top 5 Funniest Comics” in Portland by the Willamette Week in 2016 and is a two-time winner of PDX Dirty Dozen Roast Battle. She has also been selected to showcase in the All Jane Comedy Festival, Idaho Laugh Fest, Bridgetown Comedy festival, Laughs on Fusion as well as featuring and headlining all over the Pacific Northwest. Amanda produced a comedy festival; the Undertow Comedy Festival in Lincoln City, Oregon April 2018 featuring comics such as Ron Funches, Jeff Dye, and Judah Friedlander. She did stand-up comedy for the first time when she was eight years old! Yes! You read that correctly! It’s no wonder you get a feeling when watching her that some people are just born funny. seen on Conan and Comedy Central, Chelsea Lately and the Late Show! !